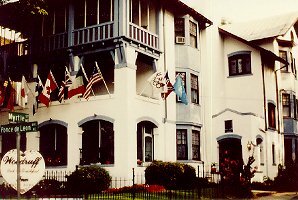 Atlanta's Woodruff Bed & Breakfast Inn is located in Mid-town Atlanta. Mid-town has been selected as the best place to locate an office in the United States. The Woodruff borders the residential area but is central to many fine restaurants, many cultural activities, and most convention centers. Atlanta's premier architect of 1900 designed this eloquent home in 1905. The home was finished for a very prominent family in 1906. Stained glass windows, hard wood floors and high ceilings adorn this solid brick structure. 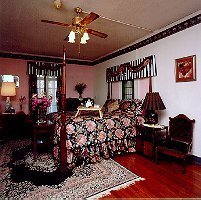 The present in-house owners and innkeepers have meticulously restored the home and decorated it with beautiful antiques. The post-Victorian eclectic styling was "a first" in Atlanta. The Jones' have finished twelve beautiful rooms. Twelve bathrooms, three Jacuzzi hot tubs, three fireplaces and several porches insure a stay to everyone's liking. A full Southern Breakfast and true Southern Hospitality will get your day started with exuberant enthusiasm. We have reserved a smile for you, please call and reserve your room.